The AJA LUT-box allows you to load 3D LUTs via USB to adjust the color space from a source signal, ensuring that every monitor you use shows the correct look for that signal. It supports 3D LUTs at 17x17x17 at 12-bit processing in .lut, .txt, .3dl, .cube file formats. Featuring HDMI and 3G-SDI outputs, it lets you output to HDMI and SDI monitors at the same time from a single unit. The original footage is maintained in an alternate color space so you can take advantage of additional dynamic range. Using a free-to-download AJA MiniConfig control software, you get to select 8 of 16 SDI embedded audio channels and pass them to the HDMI output. Two channels of RCA audio output allow you to pass separate RCA audio at the same time with your HDMI audio. MiniConfig also provides detailed information about the current input and output formats, allows you to control all the parameters of the LUT-box, and lets you download firmware updates. It's compatible with Mac and PC and interfaces with the LUT-box via a USB connection between the LUT-box and the computer. LUT-box features a compact, portable, and rugged design and comes with a 3.2 ft HDMI cable and a universal power supply with international plugs for use around the world. 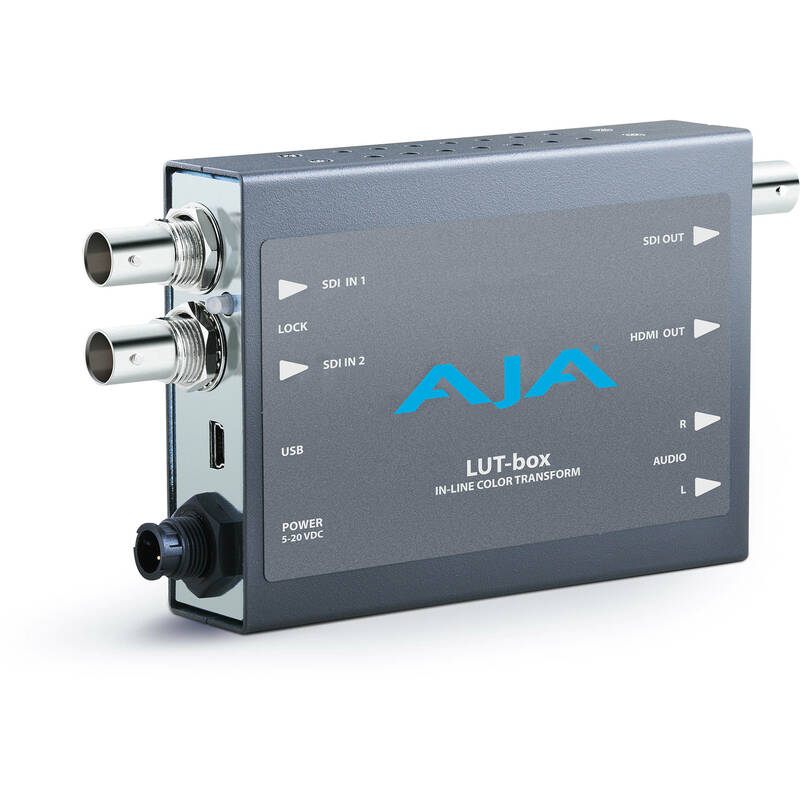 LUT-box allows you to load 3D LUTs via USB at 17x17x17 with 12-bit processing. Up to 16 channels of SDI embedded audio can be passed to the 8 channels of embedded audio on the HDMI output. The audio can also be delayed from 0 to 7 frames for proper synchronization with the output video. Two channels of RCA analog audio output allow direct external monitoring without the need to disembed the audio separately. The LUT-box supports AJA's free-download MiniConfig software, which provides detailed information about the current input and output formats, allows you to control all the parameters of the LUT-box, and lets you download firmware updates. MiniConfig is compatible with Mac and PC and interfaces with the LUT-box via a USB connection between the LUT-box and the computer. Box Dimensions (LxWxH) 9.5 x 5.8 x 3.8"
LUT-box is rated 5.0 out of 5 by 3. Rated 5 out of 5 by Anonymous from Great for calibration, looks, and false-color We primarily use this box to do a false-color processing on an SDI line. We've also used it to tune the color of a cheap little box camera that has little image control. Rated 5 out of 5 by Ryan from Perfect for my needs Works perfectly to apply a display calibration for my panasonic Plasma.